Years ago I read an article. They asked couples who were married for longer periods of time to share their secrets for success. “Lowered expectations” was the most common response. 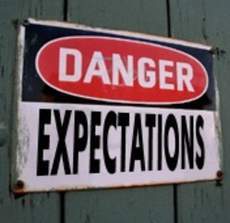 I can’t say I always like the idea of lowering my expectations. I believe (and teach) that clarifying and sharing mutual expectations is a first step to effectively communicating and working (and living) with others. That being said, there’s something in what the long-time married couples shared, and what Alice Walker’s quote highlights. When I hold onto my expectations, or at least hold them at the level where I think they should be, I often set myself up to be disappointed. And when I manage to lessen, lower, or even forget about my expectations, I allow myself to be pleasantly surprised by what those around me have to offer. It’s important to clarify expectations when we’re managing and leading others. It’s useful to share expectations when we’re navigating relationships, both personal and professional. But when I’m faced with a tough situation – or person – if I can lower my expectations, if I can expect nothing, I no longer feel frustrated that things aren’t as I want them to be. Instead I often find myself delighted by how things work out. What expectation can you lessen, or drop altogether? Expect nothing. Let yourself be surprised. When have you lowered your expectations and been pleasantly surprised? For support in finding surprises all around you, contact Lisa at lkohn@chatsworthconsulting.com. Lisa, this is just too funny. I wrote almost the opposite perspective today. I am adding the link to your post now. That’s what makes this so much fun! Hi Karin – I saw your post (and loved your post) and thought the same thing. I actually believe both to be true. There are times when I need to lower my expectations so as not to get disappointed when I don’t get certain outcomes I’m perhaps clinging to, and times when I need to raise my expectations so that I get at least that. In my mind, like most things, a balance! If the goal is to get along with someone with whom you explicitly trust and have no specific requirements for “better”, then of course this attitude is natural and healthy – but if there’s a goal (particularly a goal that’s a stretch) having expectations is important. To me leadership is about establishing meaningful “stretch goals” and holding people to these. Thanks for your thoughts John. I agree with you – and think (as is often true) a balance is best. Plus the ability to move back and forth between approaches. Leadership is about establishing “stretch goals” and holding (and helping) people to these. And I believe it is also about realizing when the expectations I may hold for someone else may be unrealistic (given their present circumstances), or based on my biases, or setting me up to become frustrated and annoyed. If I enter into these tough emotions, I can no longer best support and hold them to goals, I’m just annoyed. So how do I balance between letting go of expectations that are potentially hurting me, the relationship, and results, and holding to expectations so that people can rise to their best selves. What do you think? I find it fascinating.